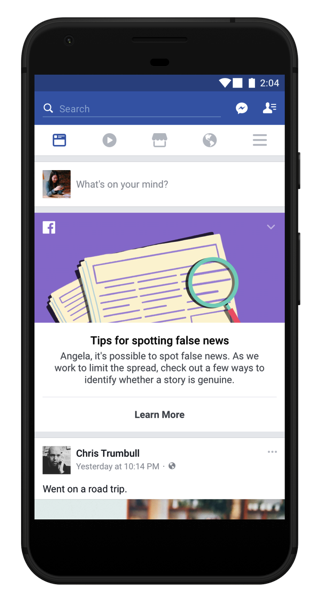 As part of its ongoing efforts to combat misinformation, Facebook has announced that it is rolling out a new educational tool to help people spot fake news. The social network has partnered with First Draft, a non-profit organization dedicated to improving skills and standards in the reporting and sharing of information online, to release the tool. “News Feed is a place for authentic communication. Improving news literacy is a global priority, and we need to do our part to help people understand how to make decisions about which sources to trust. False news runs counter to our mission to connect people with the stories they find meaningful. We will continue working on this and we know we have more work to do”. Facebook says that the tool will be featured at the top of News Feed for a few days to people on Facebook in 14 countries. When people click on this educational tool at the top of their News Feed, they will see more information and resources in the Facebook Help Center, including tips on how to spot false news, such as checking the URL of the site, investigating the source and looking for other reports on the topic.